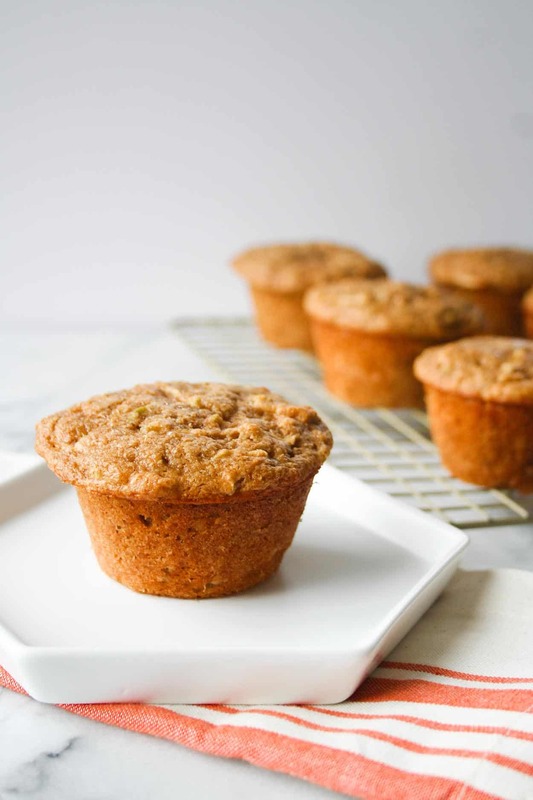 These incredibly moist and protein packed Apple Cinnamon Protein Muffins are sweetened with maple syrup and are the best post workout breakfast! Last week I shared with you one of my favorite on the go breakfasts – Almond Butter Protein Bars. 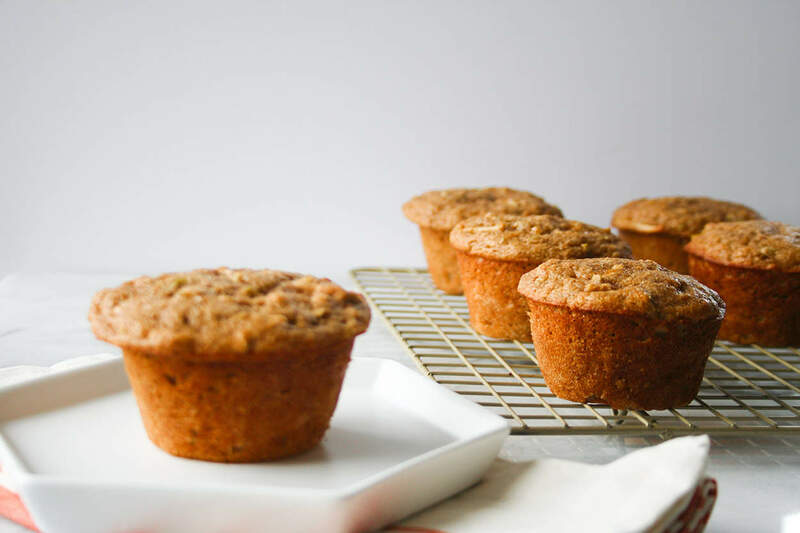 Whelp I’m back at it today with another on the go breakfast recipe in muffin form – Apple Cinnamon Protein Muffins to be exact. I used Kodiak Cakes Protein Packed Flapjack and Waffle Mix to make these muffins. Have you heard of Kodiak Cakes? I first heard of them from Kylie who uses their mixes in recipes all the time. Then I saw them at Costco, but was nervous about committing to such a big box. So I bought the mix from Jewel, fell in love, and regretted not purchasing the absurdly large size originally. The good news is that I went to Costco last night and righted my wrong. Aaaaand a reader recently told me about a peanut butter version so that’s next on my list! I’ve been experimenting with Kodiak Cakes (protein packed) mix and seriously love the stuff. This mix is made with 100% whole grain wheat flour and 100% whole grain oat flour and has a protein blend added that boasts 14 grams of protein in a single serving of flapjacks. This stuff will stick with ya! They even have a gluten free mix that is perfect for those with allergies. THANK GOODNESS. While the mix makes delicious pancakes (obviously), I like using it as a flour substitute in other baked goods. 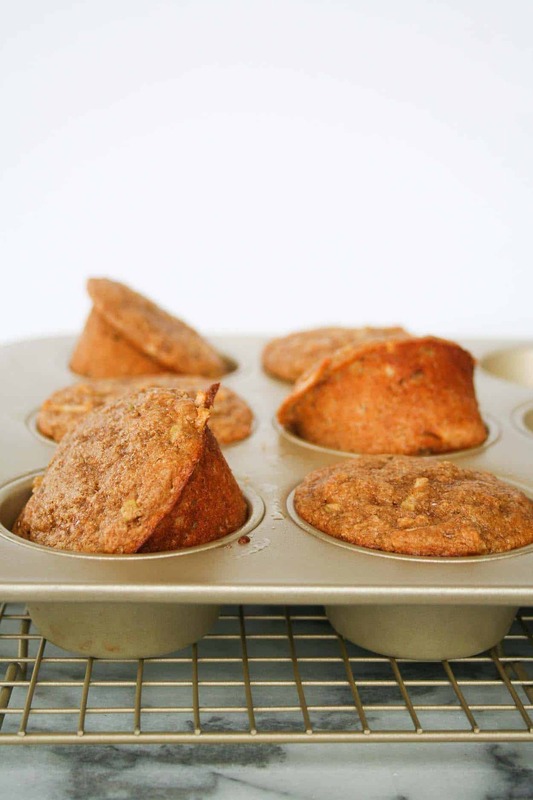 And I am loving it in these apple cinnamon protein muffins. The trifecta of muffin making. Each muffin yields only 135 calories and 6 grams of protein. I always eat two in a single serving – now that’s my kind of protein in a baked good! The only thing that would make them better is if you sprinkled some grain free granola on top before you bake! Oh my goodness, I’m salivating just thinking about it! 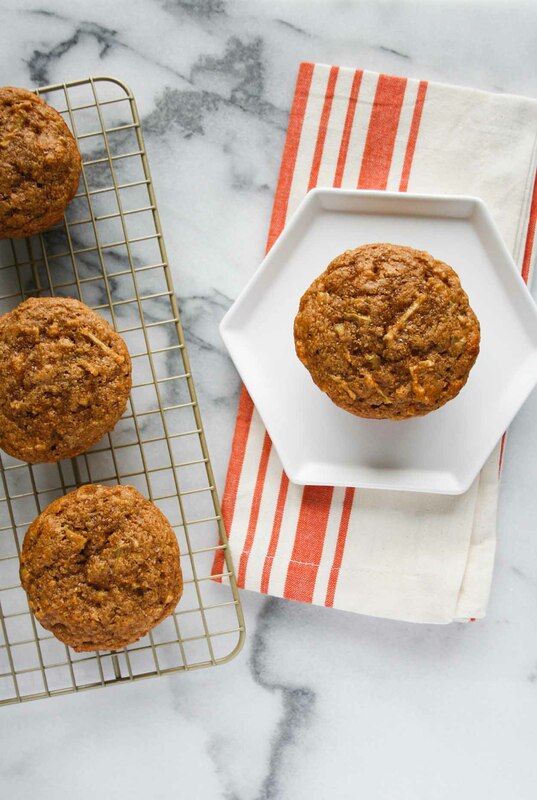 Apple Cinnamon Protein Muffins are one of my favorite ways to eat breakfast on the go! If you make these or any of my recipes, don’t forget to post a picture social media and use the hashtag #imhungrybynature for a chance to be featured! 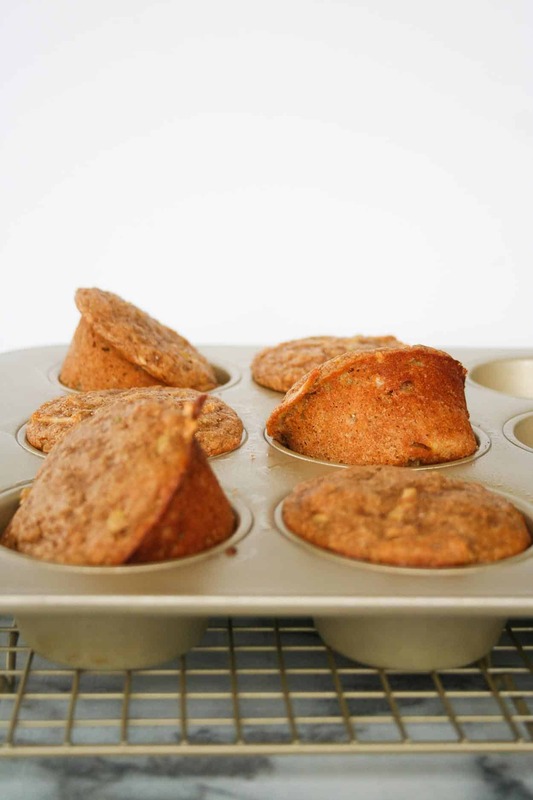 A reader has success turning these into lactation muffins! Add 1/2 cup oats, 2 scoops (~1/4 cup) brewers yeast, 1/4 cup flax meal, increased the applesauce to 3/4 cup and add ~1/4 cup almond milk. Weight Watchers Points: I personally do not calculate nutritional value for my recipes, but this version was calculated by Swanson Health Products for their website and it is showing as 4 smart points. They found a light maple syrup that was only 6 smart points (instead of 12), so that would make the recipe 2-3 smart points each. It would be 5 smart points for 2 muffins if you bought a light syrup. Ellie! These. sound. to .die. for. I have been hearing a lot about Kodiak Cakes mix in the blog world lately, I may just have to give it a go! Thank you! And you MUST! They have a traditional mix that is great, but I love to get the protein packed version. I also used their mix in my almond butter protein bars which taste like cookie dough. So good! Try adding quest protien powder (they have a plain) It will add 22 grams of protein and only 1 gram of sugar and no saturated fat. I make several this way. That is an awesome idea Angela! How much powder did you add? How much do u add? Hi Lisa! How much do you add of what? diabetic so I substituted sugar free maple syrup . Would love to have more muffin recipes with the Kodiak Cakes protein mix. Thanks Norma – I’m glad you love them! I’ll do some experimenting with kodiak cakes for you!! Maybe a gingerbread flavor?? Also, you should look up my almond butter protein bars… those were made with kodiak cakes protein mix and are seriously one of my favorites recipes! ohh i havent made apple muffins yet, but i’ve been enjoy a lot of apple pastries lately… heh 😉 what is the protein blend in kodiac? Well you will have to try these then! The Power Cakes Protein Blend consists of wheat protein isolate, whey protein isolate, milk protein isolate, and egg whites. Make sure you stop back and let me know what you think of the recipe! Just made these the other day. They are incredible! Thanks for sharing! Thank you Anja – I am so glad you enjoyed them. They are one of my favorite! And I love the added protein boost! Mine are baking right now, so excited!! 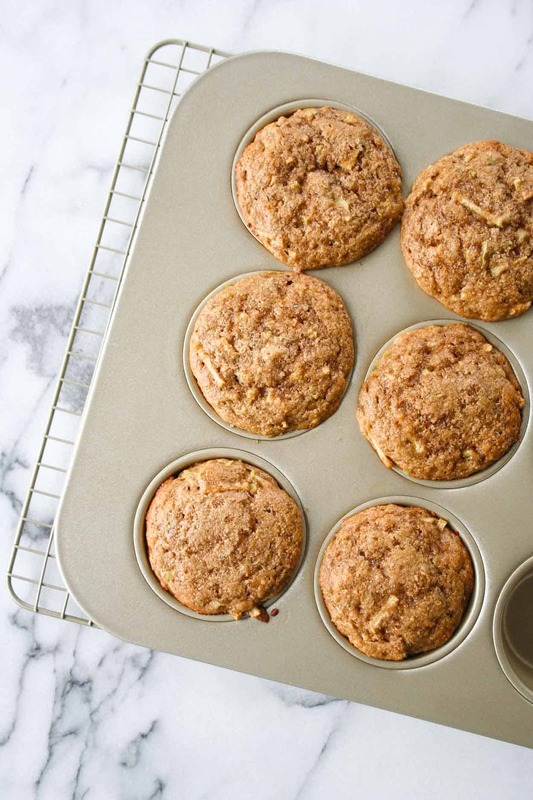 I was wondering if you used a cupcake pan or an actual muffin pan because I used a muffin pan and wanted to see which size the nutritional facts you posted were for…thanks for the awesome recipe! Hi Carolyn! How did they turn out?! I used a standard 12-well muffin pan (http://www.williams-sonoma.com/products/usa-pan-goldtouch-nonstick-muffin-pan/?pkey=cbakeware-usa-goldtouch&&cbakeware-usa-goldtouch). This is my go-to for all muffins and cupcakes! Made mini versions of these last night and am loving it! How long would you say they would last for? Thanks! I’m about 1/4 through with snacking on them for breakfast. If it lasts all week, that would be amazing! Where can you get the Kodiak mixes? Hi Cyndy! You should be able to find them at your local grocery store, but I buy them from Amazon – http://amzn.to/2qTsFbI. Let me know what you think of the muffins! It is great for pancakes! You should check out my protein packed gingerbread pancakes – I use Kodiak Cakes in that recipe too! Thank you for this recipe. Love finding new ways to use Kodiak cakes!! Have you used other flavors of syrups? Do you think Karo syrup could be substituted for the maple syrup.? Just not a fan of maple. Thank you. Thank you Martha! I haven’t but I’m confident honey would swap very easily. I haven’t used Karo Syrup before, but I would love to hear the result if you try it! 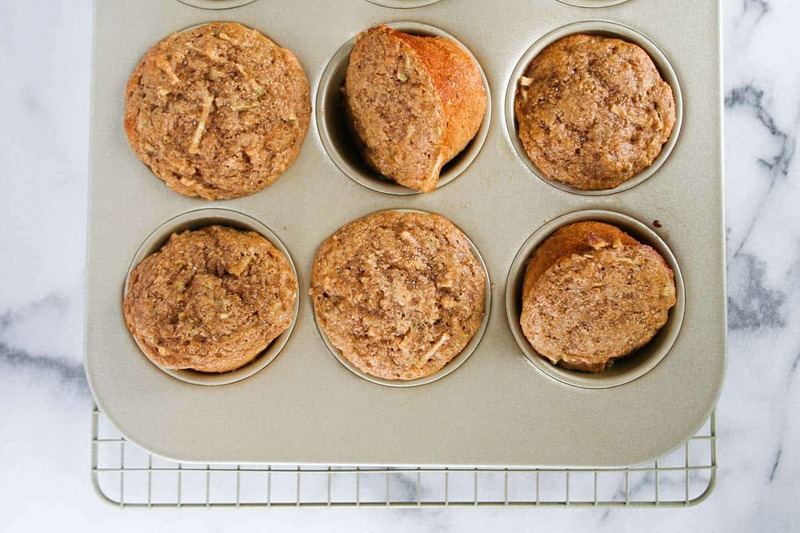 Does this recipe only make 6 muffins? Hi Joyce! Yes, the recipe makes 6 muffins but it is easily multiplied! Thanks Ellie! These look really good. Think I will see if I like them before I try doubling. That’s a great idea – and I would love to hear what you think of them! These are awesome so thank you! They only last a couple of days at my house. I recently substituted a little carrot for some apple and added some flax seed meal and still delicious. Also what a time saver to grate the apples! I have two toddlers that like to help and these are quick and easy. Thank you Alexandra – I am so glad you enjoyed them! And I looooove the carrot swap – I’m going to try that next time! Has anyone calculated the nutrition facts for these? I calculated 32cal per muffin (using sugar free syrup) but that seems too good to be true! Hi Caitlin! I don’t have the calorie count for these, but I do have the weight watchers points breakdown if you would like me to send you the information. Let me know if you do and I will send over an email! I will send you an email with the details! I’m just trying the recipe right now! They smell incredible! I would like the weight watchers break down please. Please send me weight watchers points for these delicious Apple cinnamon muffins! I would like to have the WW points for the Apple cinnamon protein muffins. Haven’t tried them yet, but plan on it. Thank you! Ww points please. These look yummy! Wondering what the calories are for 1 muffin. With my last batch I subbed the 1/2 cup of apple sauce with pumpkin! So good! I usually double the recipe and put 6 in the freezer. My 1yo loves these for breakfast, as do I so we go through a dozen every week! I’m always amazed at how the protein sticks with me, I’m never hungry till lunch! Hi Corey! I actually do not know what the calorie count is – calories are not something that I pay much attention to. I try to focus on putting food made from real, nutritious ingredients in my body and the calories seem to work themselves out. It looks like you used shredded apple in them as well. How much? Did you also use the applesauce then too? Hi Krystal! Yes, I used shredded apple and applesauce. The recipes has 1 cup of shredded apple listed in addition to the 1/2 cup applesauce. Let me know how they turn out! I would like to have the WW smart points, please. Could I have the WW points too? Thanks! I loved these so much I doubled the recipe. I would love to try them with pumpkin. A great way to mix up my protein options in the morning. I’m so sick of shakes!!! I would love the weight watchers point value of these. Thank you !!! Could you please email me the WW points? Thank you! please e mail me WW points! We topped them with walnuts and chocolate chips. Baby, Dad and Mom enjoyed them plain and topped. Ours were extremely moist but the toothpick was clean. That topping sounds PERFECT! Oh my gosh, now I want to make them again 🙂 And yes, they are moist! I’m glad the whole family enjoyed them! Could you send me the weight watchers points please? These look delicious! I just made this, but doubled the reciepe,and then made the mistake of reading the oven temp at 450, so my did not get cooked all the way though. I am returning to oven to try and finish the muffins. I doubled the receipe, and ended up with 15 muffins. So I entered the receipe on fitclick, and it gave me 86 cals per muffin and I calculated 2 ww points plus per muffin. Really trying to reheat the oven and save (finish cooking ) these!! They would good but doughty after baking the first time, hopefully can rebake a little. Oh no Linda! Let me know how they turn out!! I would love to the ww points per muffin if you make 6 muffins. Thank you! I got a bounce back – what is your email? What are the WW PP ? This recipe looks amazing. You mention that you have the WW points for it, are you also able to provide the macros breakdown? These are so good! I was googling around for something to bake for breakfast with Kodiak, came across these, and was not disappointed. So delicious. Thank you! Please email the WW points nutrition info. Cant wait to try them. Thank you! Can you please share the WW points? Thanks so much. These were GREAT. I followed the recipe except I used 1/4 cup of smuckers sugar free syrup. That made them 1.1 sp on freestyle. They are delicious. I loved how they were just a little sweet but not cake like so they are wonderful for mornings. Thanks so much for the recipe! What an awesome swap Sandi – Thank you for sharing!! And I am thrilled that you love them! I just found this recipe, and it looks delicious! I’d love to have the ww points, please. These look delicious! I’m eager to try them. Is there a reason you’re not posting WW points? I would love to know points as well pleas. Hi. I am also eager to try these. Maybe you can answer this question. Do you know if people with a milk/lactose problem can eat these. I am concerned about the milk proteins in the Kodiak product. If you do not know the answer everything is good. Thanks for your time and recipes!! Hello! I unfortunately do not know if people with diary issue can eat Kodiak Cakes – I’m so sorry I couldn’t be more helpful! These muffins are fantastic! I’ve been on the search for a healthy breakfast muffin for years. 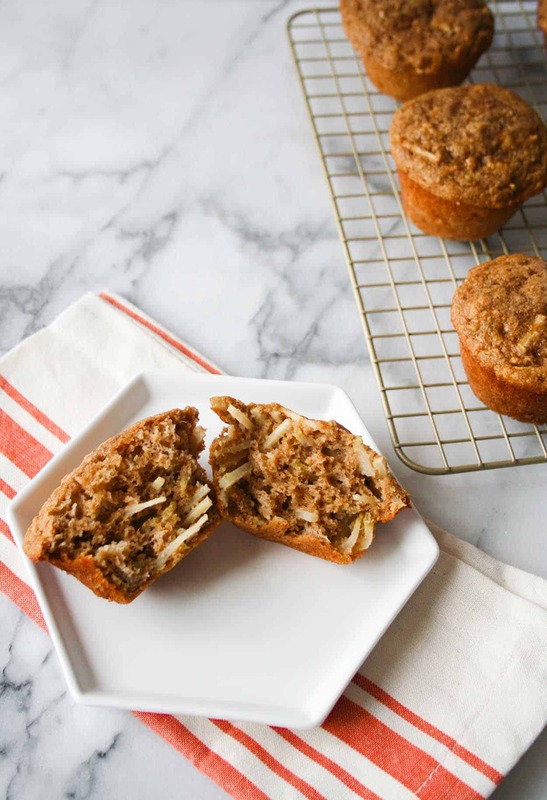 Would it be possible to swap out the apple for banana to make banana muffins? Or are there additional ingredient swaps/additions I would need to make? Hi Emily – thank you!! I would swap out the applesauce for mashed banana (use the same amount) and you could omit the shredded apple if you want. You shouldn’t have to make any other substitutions! And because the banana will be much sweeter than the applesauce you could cut down or remove the maple syrup all together. Let me know how they turn out! Lactose is milk sugar not milk protein. Whey is milk protein. So if you are just lactose intolerant, i.e., can’t break down the disaccharide lactose into better absorbed monosaccharide, you should be fine. If you have a true milk allergy it might be a problem. Highly impressed with this recipe (and its versatility)! I’m an almost-everyday Kodiak Cakes eater but hadn’t tried using the powercakes mix as a flour before. Was excited to give it a try and got all the way to mixing the wet ingredients when I realized I didn’t have any applesauce left. I whisked up a super ripe banana, though, and since it was pretty large used it to replace both the applesauce and the maple syrup. Wasn’t expecting much but the recipe came out great. I’ll be sure to have applesauce on hand next time–know this would’ve been even better with stronger apple flavor–but wanted to weigh in on this. It was a phenomenal recipe and I’d recommend it to a friend/bring it in for others to enjoy at work any day. Wow Cait – Thank you for sharing your swaps!! I am so glad I was able to introduce you to Kodiak Cakes as a flour… it’s one of my favorite things! Please email me the ww points as well as the almond butter one! These are awesome!!! I was wondering if I could get the WW points for this recipe. I’m so sorry Sam – that is odd! I have never had that happen. Is there a chance that any of your ingredients were expired?